Like other Imperial Assault figure packs, these expansions offer new missions and cards for both your campaigns and skirmishes alongside sculpted plastic figures. 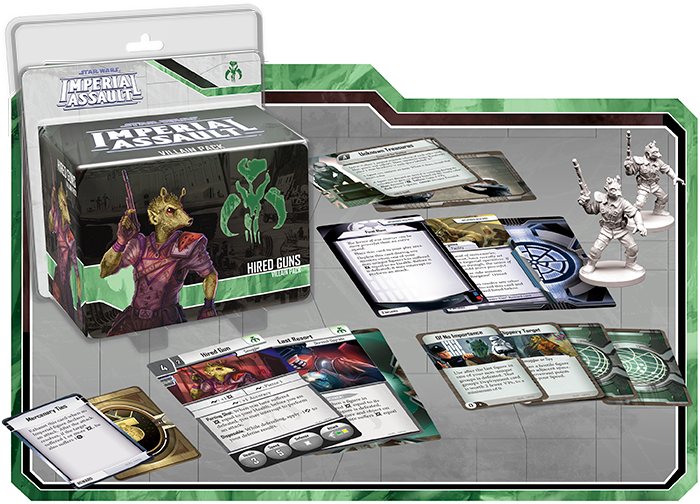 Unlike previous figure packs, however, these Ally Packs and Villain Packs have no corresponding larger expansion, meaning that these figures enter Imperial Assault for the first time in these expansions. Call for reinforcements and revolutionize your adventures in the Star Wars™ universe with these figure packs! 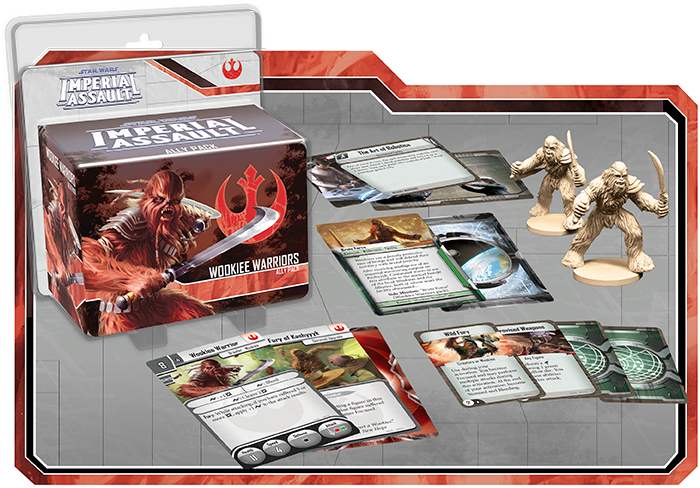 In our first preview of these Imperial Assault figure packs, we traveled to the forests of Kashyyyk to witness the brutal strength of the Wookiee Warriors. The Wookiees are formidable fighters of prodigious strength and skill, and in the game they boast a vast amount of health and dangerous melee attacks. You may use the Wookiee Warriors in your campaign to battle the Imperial forces that stand in your way, or you may include them in your skirmish army to gain some resilient fighters who can go toe-to-toe with even the strongest villains. New missions and cards for campaigns and skirmishes allow you to unleash the Wookiees’ fury on any target. Our second preview explored the new cards and powerful tactics offered by the Stormtroopers Villain Pack. This expansion offers three new Stormtroopers figure, featuring an alternate pose from the Stormtroopers included in the Imperial Assault Core Set. 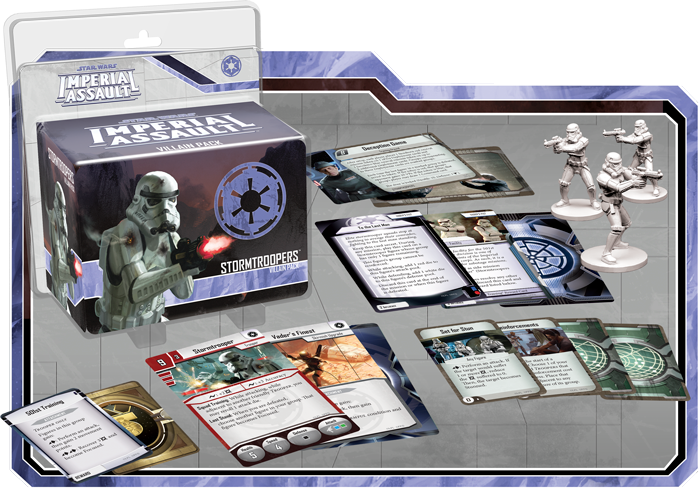 What’s more, this figure pack offers new campaign and skirmish missions alongside several new Agenda cards and Command cards that make your Troopers much more dangerous. You may tempt the heroes to assault the training facility of the renowned 501st Legion, or use the battle tactics of the 501st to enhance your Stormtroopers in a skirmish game. Finally, we turned to the Hired Guns that serve the galaxy’s Mercenaries in our last preview. These fighters are cheap and disposable, which makes them very useful for quick alpha strikes against your opponent’s forces. In a campaign, the Hired Guns can plague the heroes with countless attacks and keep coming back to reinforce your forces. Alternatively, you may include the Hired Guns in your skirmish army—by sending these mercenaries straight at your opponent at the beginning of the game, you can do plenty of damage for a minimum loss to your own forces. Whether you play the Hired Guns in a campaign or a skirmish, the new missions and cards included in this Villain Pack make this expansion worthwhile for every player. With these three new Ally Packs and Villain Packs for Imperial Assault, you’ll gain the opportunity for countless new adventures in the Star Wars universe. Summon reinforcements for your army and pre-order your figure packs at your local United States retailer today!